On the road to success, that first step is often the most important. This past week, our campus community did a wonderful job of making sure that every new and returning Huskie got off on the right foot. And people noticed! This email from Alison Wilson, of Joliet, who dropped her daughter off Friday, is typical of the type of feedback we received about Move-In Day. Even the media, including the Daily Chronicle and Rockford television stations WREX and WTVO, took note of the incredible Huskie spirit on display. That type of praise is hard-earned. I want to thank every member of the campus community (we had more than 1,400 volunteers), and the broader communiversity (we had 40 local dignitaries and more than 100 community members in all) who contributed to the first-class welcome our students received. Of course, that welcome extended well beyond Move-In. It also included a weekend full of events planned and executed by Student Involvement and Leadership Development, the Campus Activities Board, the Student Recreation Center and other groups around campus. 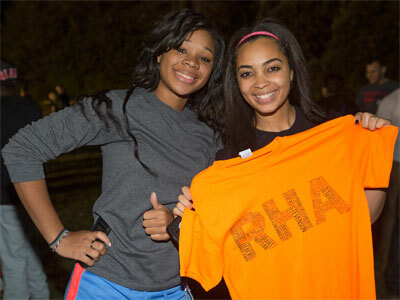 The Band Run, the revamped Huskie Family Welcome, the Residence Hall Association Block Party, CAB’s Glow in the Dark Dance Party, and the President’s Picnic all drew thousands of students who not only made new friends, but also forged connections with the university that we hope will last a lifetime. Thirty students returned the favor, with newly arrived Huskies quickly giving back to their community during the Saturday of Service event, working alongside of local volunteers in the Communiversity Garden that provides produce to local food banks. As classes started, the line-up of receptions and open houses at colleges and various departments around campus this week, went a long way toward helping students new and old better connect to NIU. Even the little touches, such as Huskies Helping Huskies volunteers offering directions made a huge difference. That Huskie spirit was also on display during our two-day orientation sessions held over the course of the summer. The revamped program was very well received and included local community leaders volunteering to lead bus tours of DeKalb. We also received rave reviews for the beauty of campus. I applaud, everyone who helped out with these activities (and all of the others not mentioned here). Whether you were directing traffic, serving food, cleaning up, guiding students or working behind the scenes, you were embodying what we mean when we say that attracting and retaining students should be a priority for all of us. Thanks to all of you, it has been a fabulous start to the school year. Let’s keep the momentum rolling by bringing this same Huskie spirit to everything we do.